If you are into history, the Egyptians, or even just the technical death metal band, ‘Nile’, this is the tattoo for you. Not scary, but so creative, the designs remind one of an obelisk. 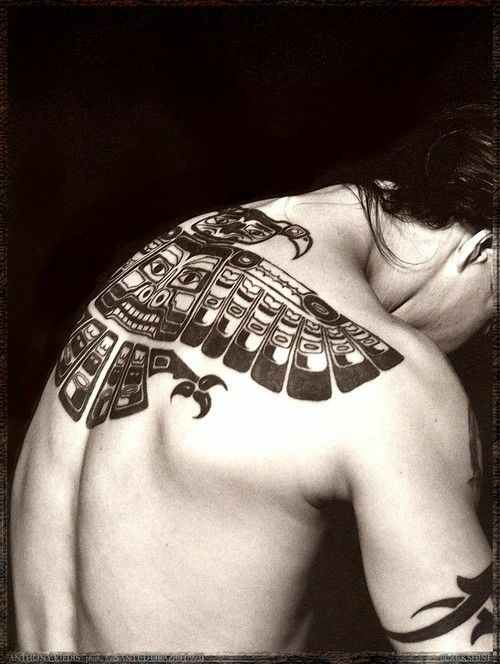 This stunning creation, made with black ink, depicts the falcon which is entirely filled with hieroglyphs. 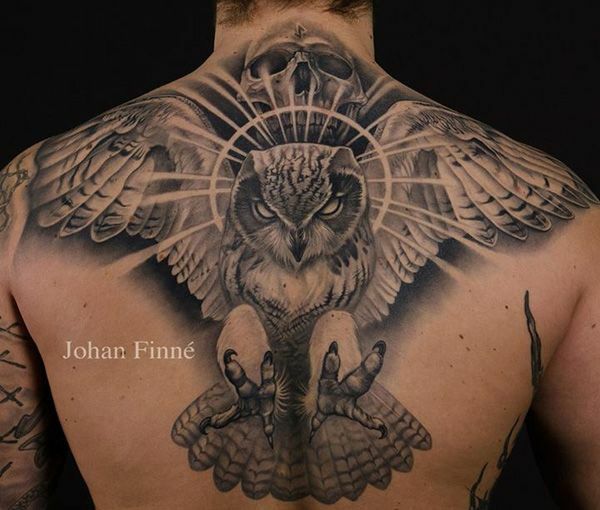 Darkness, beauty, and more – this tattoo idea is for a true artist at heart. Made in shaded black, it requires immense patience and detail to create this beautiful masterpiece. 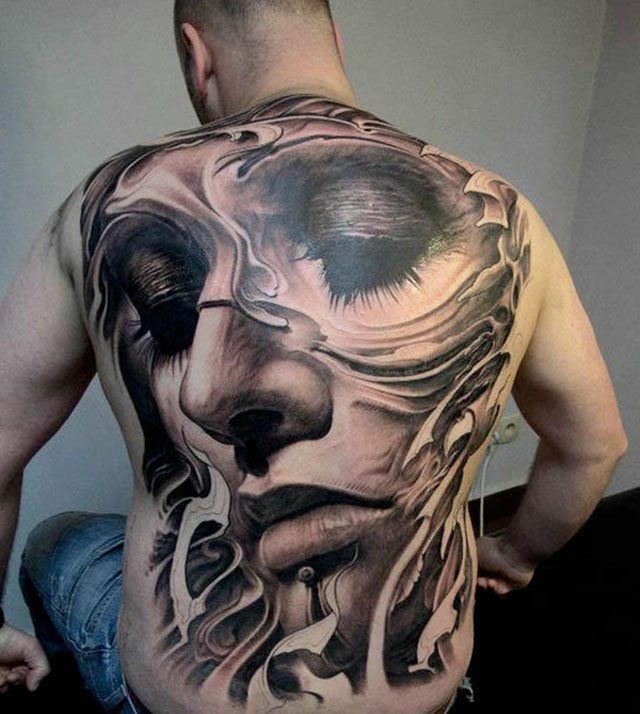 Moreover, the detailed border provides it with a 3 dimensional effect, as the woman’s face is effectively within the back. We all have an angel within us, and this one is proof. 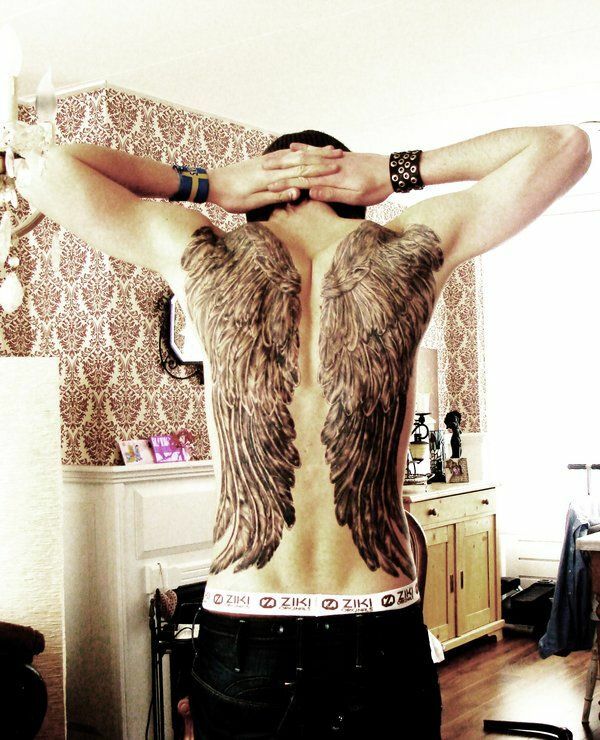 A brilliant tattoo for a man, the wings are dark, and the feathers clustered. While he may not be ready to fly just yet, these wings give his plain back an all new perspective. This tattoo is done entirely in shaded black, and includes intricate details ranging from a spider’s web to a letter and plenty more. However, it only covers the upper back and arms, effectively framing the rest of your back, showcasing the model’s muscular build. Skulls are gaining popularity. They are deathly, yet fascinating. As a result, they are frequently stylized into different forms, and this one sports monster teeth and metal additions. A trident in the nasal cavity along with the intricate detail and shading throughout brings the tattoo alive. 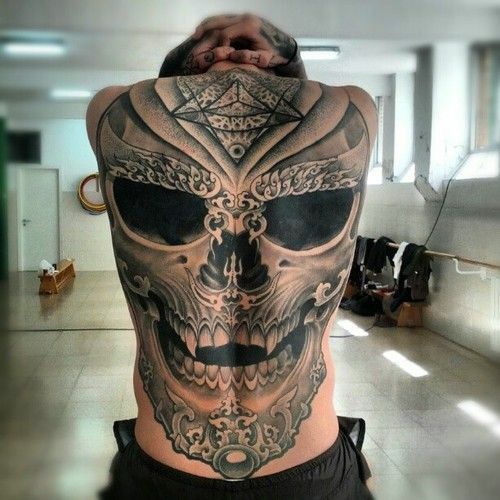 While tattoos in black have a unique appeal, it is only a few that can pull off a colorful one. The melange is stunning. The ship, the roses, the eagle, and the serpent have all been arranged beautifully, adorned with lightening peeping out from the clouds. Not a single detail has been skipped in creating this little bit of wonder. A sci-fi classic, who doesn’t want to be a cyborg? This tattoo will make that fantasy come true. 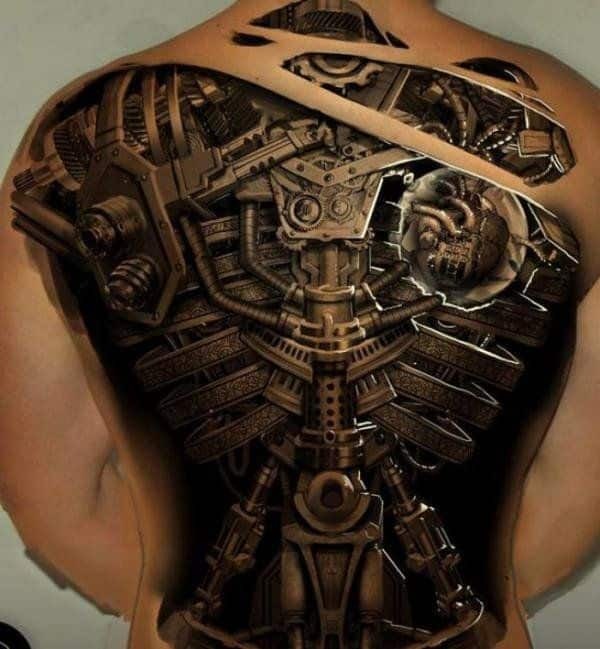 Made in black, it is a 3-D creation depicting what is under your skin – some extremely advanced mechanical marvels. Whoever said you were human has never had a peek at your back. Angels are not always beautiful women. Sometimes it is men like these. The muscles depicted somehow emphasize the suffering in the image, while the wings outspread exude a surreal aura. While black is captivating, blue is absolutely enthralling. Designed to capture eyes and hearts, this simple tattoo comprises of a range of differently styled circle present in a straight line along the spine of the back. Moreover, the detailed design of the blue on the arms only serves to highlight the beauty of the color itself.